While some fundamental differences may exist, magic truffles and magic mushrooms are very similar. This is because both of them contain the same psychoactive compounds responsible for inducing a psychedelic and euphoric high. Let's cut to the chase: apart from the visual appearance, there are no major differences between magic mushrooms and magic truffles. The so-called truffles are, in fact, not really truffles at all, as those belong to the genus Tuber. 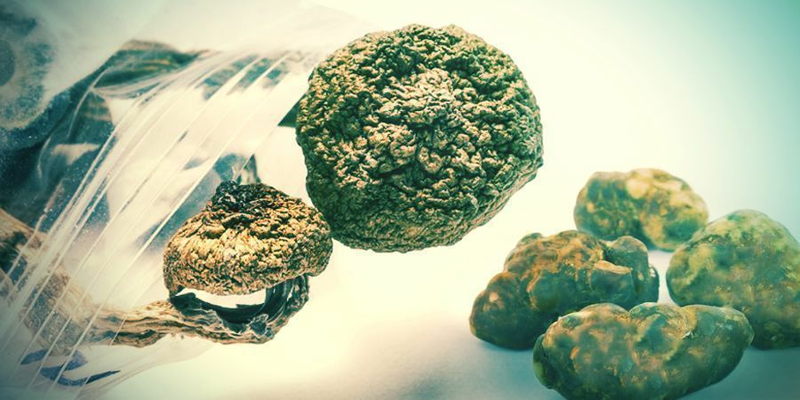 They are sclerotia that grow under the ground; Magic truffles are essentially the subterranean part of a mushroom, ready to be utilised as food reserves by the rest of the organism. However, when it comes to getting high, truffles are just as potent and intense as mushrooms. The differences between magic mushrooms and truffles begin at the growth stage. Each must be harvested differently since they grow in different places. Mushrooms can be harvested by hand, for example if you grown your own with a grow kit, as they grow above the ground. 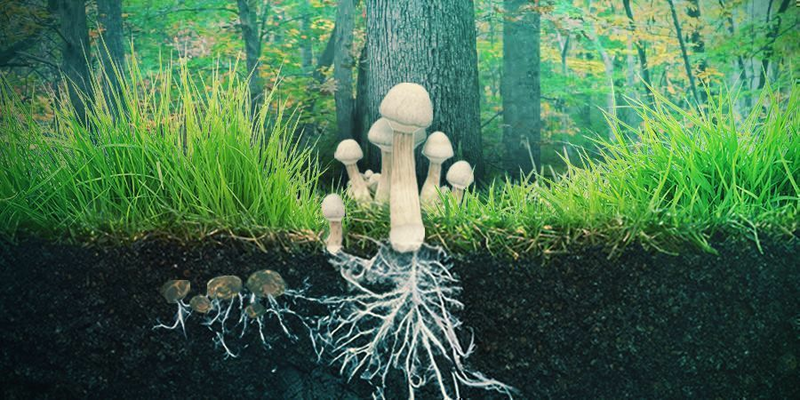 Truffles, however, must first be dug up since they grow beneath the ground, adjacent to the mushrooms. Truffles have a lower water content, so they are a little easier to dry. However, for the most part, truffles and mushrooms are both dried and stored in the exact same way. Once the truffles are harvested and dried, the biggest difference between them and mushrooms is their shape and size. Whereas mushrooms can grow to various sizes, truffles retain a small, condensed shape. As they are further dried, they tend to shrivel up even more. Mushrooms and truffles significantly differ in their moisture content. Truffles have a meagre moisture level of between 5–10%. This makes them much quicker to dry. Additionally, this is why truffles have a hard and rugged feel to them, whereas mushrooms tend to be more soft and flexible, even after drying. You may find that using a specialised truffle grinder will help you to better manage the size and shape of your truffles. 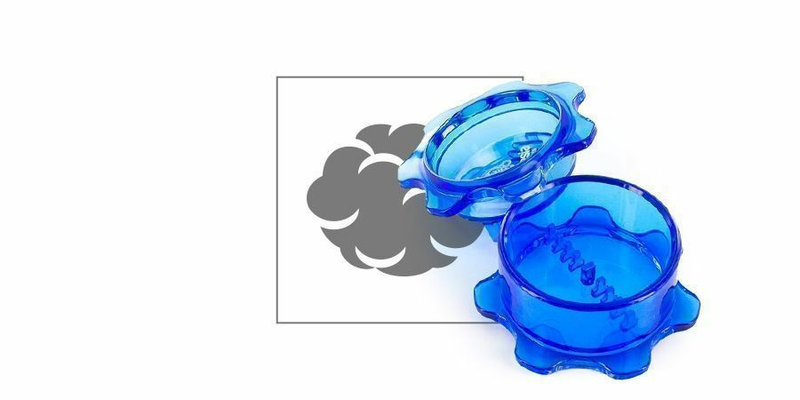 These grinders can break truffles up into easy-to-swallow bits, making consumption a more simple affair. Some people state that magic truffles are less potent than magic mushrooms. 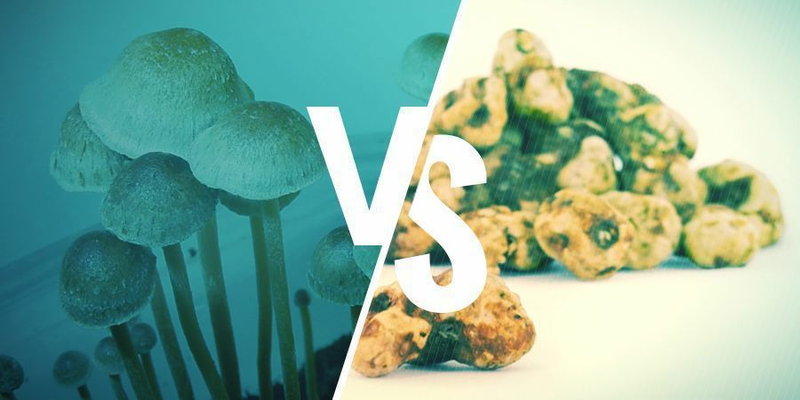 However, as both are simply different parts of the same organism, they both contain the exact same psychoactive alkaloids—psilocybin, psilocin, and baeocystin being the most prominent. Therefore, we can assume that they have the same potency. The most likely reason for this perception is because of differences in the way these two compounds are sold and consumed. As a specialty product, truffles are oftentimes weighed more precisely, clearly labelled to indicate potency, sold with more instructions, and consumed more carefully than magic mushrooms. This has led many to believe that truffles produce a “lighter”, less intense high. However, there is really no scientific evidence to support this claim. In all likelihood, whether they realise it or not, users of magic truffles are probably just consuming them more responsibly. What is different is the consistency of their potency. Because mushrooms can grow into all kinds of shapes and sizes, the concentration of psychoactive compounds (like psilocybin) contained per gram can differ. This results in inconsistent potency from one mushroom to another. Truffles, however, are much more consistent due to their small and compact size. You should assume that each truffle contains roughly the same amount of psychoactive psilocybin. Your trip should be just as long, regardless of which one you consume. Moreover, you should expect the same array of psychedelic and euphoric effects with mushrooms as you would with truffles. Regardless of which one you take, your trip should begin with an intensely euphoric come-up. This phase will transition into hallucinations and sensations of togetherness and completeness. Along with open-eye hallucinations, mushrooms and truffles can also produce closed-eye visualisations. You can expect an intense, deep, and introspective trip regardless of which one you decide to consume. Because psychedelics tend to be consumed more carefully, bad or unpredictable experiences are less likely. However, as with all psychedelics, bad trips do occasionally occur. Whether you are consuming truffles or mushrooms, it is important to be adequately prepared. Knowing what sensations to expect, and how to manage them, will be extremely helpful when consuming either. Moreover, being prepared to deal with negative emotions that may occur during the experience can greatly reduce the odds of a bad trip. Environmental factors can play a crucial role in your experience with both magic mushrooms and magic truffles. Consuming them in a safe and comfortable environment, and with reliable and trustworthy people, is a recipe for success. Eliminating noisy, frustrating, or otherwise stressful triggers can go a long way toward promoting a comfortable environment and a positive experience. Since they contain the same hallucinatory psychoactive compounds, the legal status of mushrooms and truffles tends to be the same. The Netherlands is the only country in the world that really bothers to make an official distinction between the two. Moreover, it is one of the only countries in the world where possession of small amounts of these substances is decriminalised. In certain regions, magic truffles can be purchased online and received through the mail. They come ready to consume, with clear labelling and instructions. By comparison, magic mushrooms are not sold online, legally, anywhere in the world. However, those willing to put in the time and effort can legally purchase mushroom home-growing kits. Cultivating and harvesting mushrooms can be a fun and educational experience. Any kind of equipment or information that you may need in order to successfully grow magic mushrooms should be readily available online. Once harvested, mushrooms can stay good for years if dried properly, or indefinitely if frozen. In conclusion, there is in fact no difference between magic truffles and magic mushrooms apart from there looks and how they are grown. They are components of one and the same organism with the same potency. For more in-depth information about the difference between magic mushrooms and truffles, check out this blog post. And if you are about to purchase one of the two - or perhaps even both - educate yourself on correct dosages as a part of preparing for your first magic mushroom or truffle trip.